reduce the availability of this resource both for themselves and for the other species. Figure 2 Competition for fructose between the bacteria E. coli and Pseudomonas. 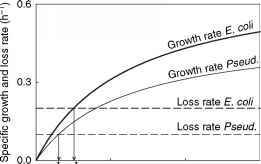 (a) Specific growth rates (solid lines) and specific loss rates (dashed lines) of E. coli (thick lines) and Pseudomonas (thin lines) as functions of fructose availability. The R* values indicate the minimal fructose requirements of E. coli and Pseudomonas. Note that the R* of Pseudomonas is lower than the R* of E. coli. 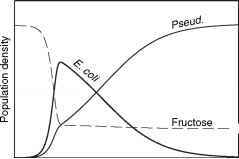 (b) Predicted time course of competition for fructose (dashed line) between E. coli (thick solid line) and Pseudomonas (thin solid line). Pseudomonas wins, because it can survive at lower fructose levels than E. coli. until the fructose concentration has been depleted to its R* value. E. coli, however, cannot grow at fructose concentrations as low as the R* value of Pseudomonas. 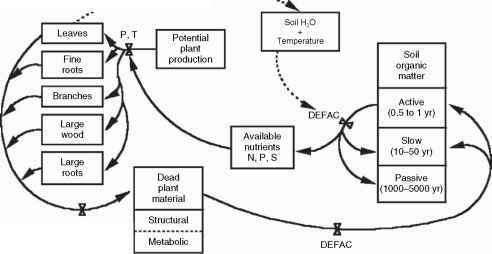 E. coli will therefore decrease and die out due to depletion of fructose by Pseudomonas (Figure 2b). The example above can be generalized to any number of species. When different species compete for a single resource in a homogeneous habitat, only the best competitor will survive. Coexistence of inferior species is not possible. This phenomenon is known as the principle of competitive exclusion. It was first demonstrated experimentally by the Russian ecologist G.F. Gause in the 1930s using three species of the protozoan Paramecium competing for bacteria or yeast cells. 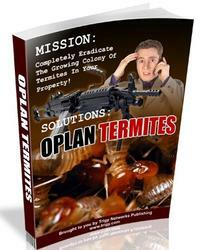 You Might Start Missing Your Termites After Kickin'em Out. After All, They Have Been Your Roommates For Quite A While. Enraged With How The Termites Have Eaten Up Your Antique Furniture? Can't Wait To Have Them Exterminated Completely From The Face Of The Earth? Fret Not. We Will Tell You How To Get Rid Of Them From Your House At Least. If Not From The Face The Earth.